This is in response to your last comment, hope this will help, will try to post some more graphs with answer. 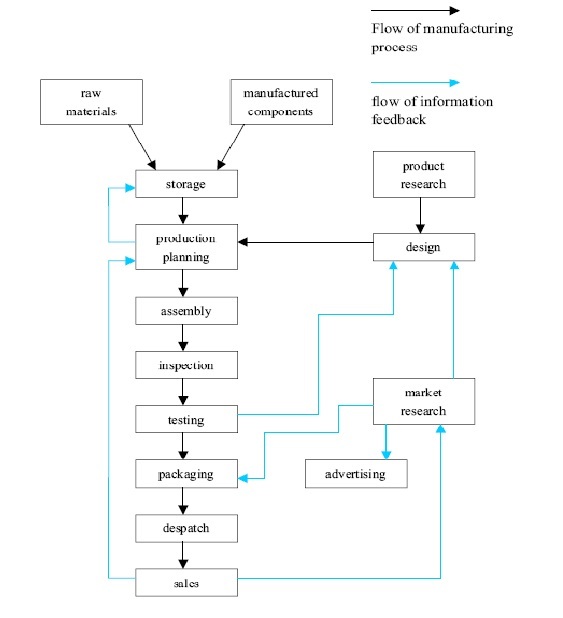 The given flowchart shows some stages of consumer goods manufacturing and the process of getting the feedback. Raw materials and manufactured components comprise the initial physical input in the manufacturing process. Once obtained, these are stored for later assembly. But assembly first depends upon the production planning stage, where it is decided how and in what quantities the stored materials will be processed to create sufficient quantities of finished goods. The production planning stage itself follows the requirements of the goods' design stage that proceeds from extensive research. After assembly, the products are inspected and tested to maintain quality control. Those units that pass the inspection and testing stages are then packaged, dispatched and offered for sale in retail outlets. The level of sales, which is the end point of the manufacturing process, helps determine production planning. A product's design is not only the result of product research, but is also influenced by testing and market research. If the testing stage (after assembly and inspection) reveals unacceptable problems in the finished product, then adjustments will have to be made to the product's design. Similarly, market research, which examines the extent and nature of the demand for products, has the role of guiding product design to suit consumer demands which may change with time. Market research, while influenced by product sales, also serves to foster future sales by devising suitable advertising for the goods. Thus the reality of consumer goods manufacturing goes well beyond a simple linear production process. Thanks for sharing this nice post.The best way to improve IELTS Graph essay section is to learn through IELTS sample Graph. Bit confused about the symbols and all, other than that this is a perfect IELTS graphic best for beginners. Good one!